Summer has passed, leaves are falling and cool autumn weather has arrived. Rather than looking ahead to the approach of winter, I’m consoling myself by retreating into memories of this summer’s rides. Since I was a terrible blogger during those months, you can come along for the review. I did pretty good job of showing all the bikes some attention (I love you ALL, my bikes. I really do). 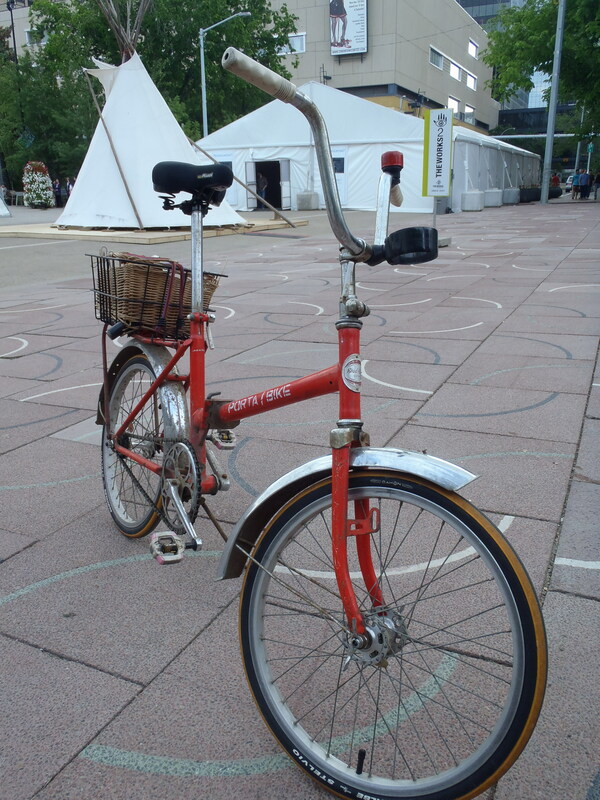 Today’s post looks at my late 70s Raleigh20 3-speed folding bike. The R20 is a really fun little city bike. It’s sturdy, maneuverable and (with the stock gearing) surprisingly fast. 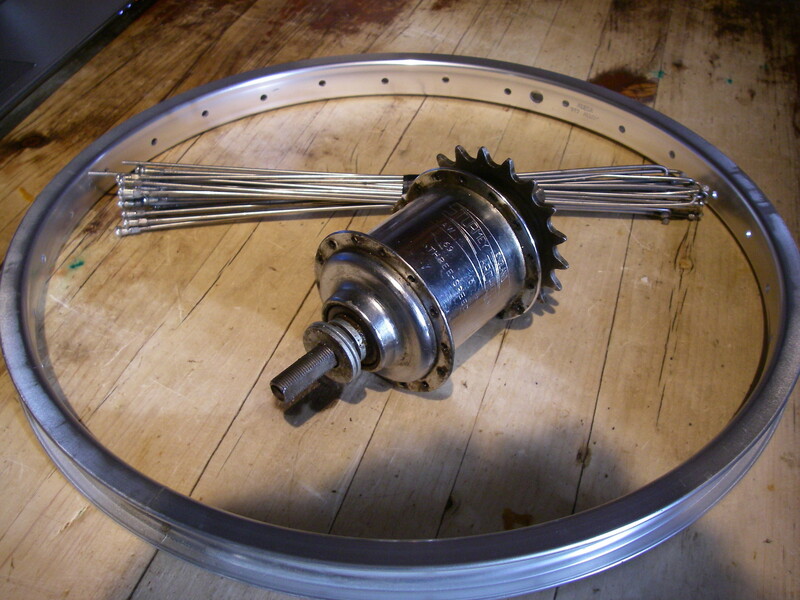 This year, I treated the bike to a set of MKS Lambda pedals that came in as a donation at BWN and rolled those 20″, 451 wheels through many kilometers. The low height of the Pletscher rack on the R20 makes the bike stable even when carrying a fairly heavy load and I loaded it up on a number of shopping trips. The rack only has two supports, not as sturdy as most current racks, and it swayed a bit under the heaviest loads. I may have been skirting the edge of destructive testing on a few occasions. That’s more than 40 pounds of water – destined to become homebrew. 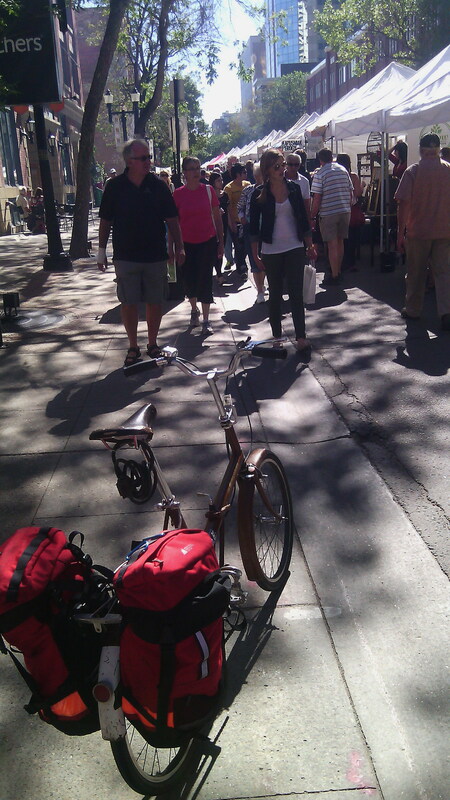 At the Downtown Farmer’s Market with a heavy load of foodstuffs. Back in June, the R20 had as chance to spend an evening in the company of its peers. The Raving Bike Fiend organized a group ride on folding bikes and there were 4 people riding Raleigh 20s of assorted ages. 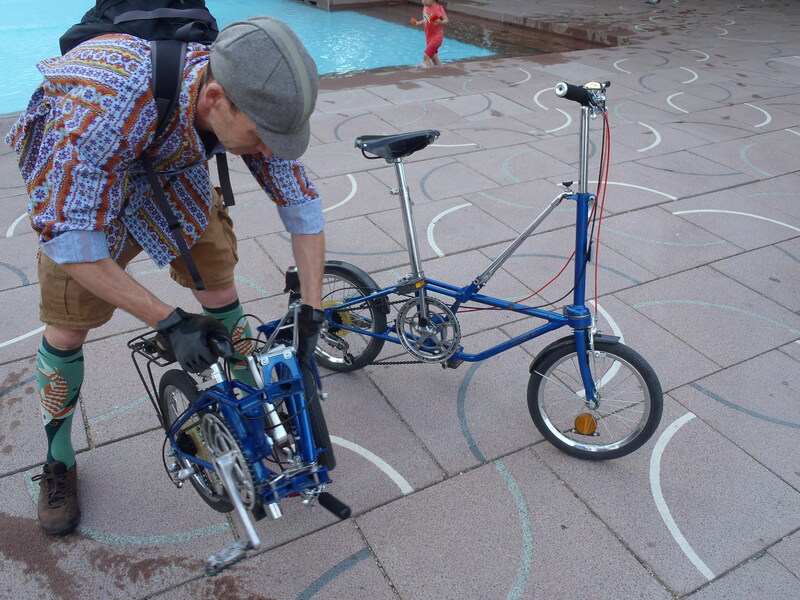 In fact, as nobody at all showed up on a modern folding bike, it turned out to be a vintage bike ride as well. 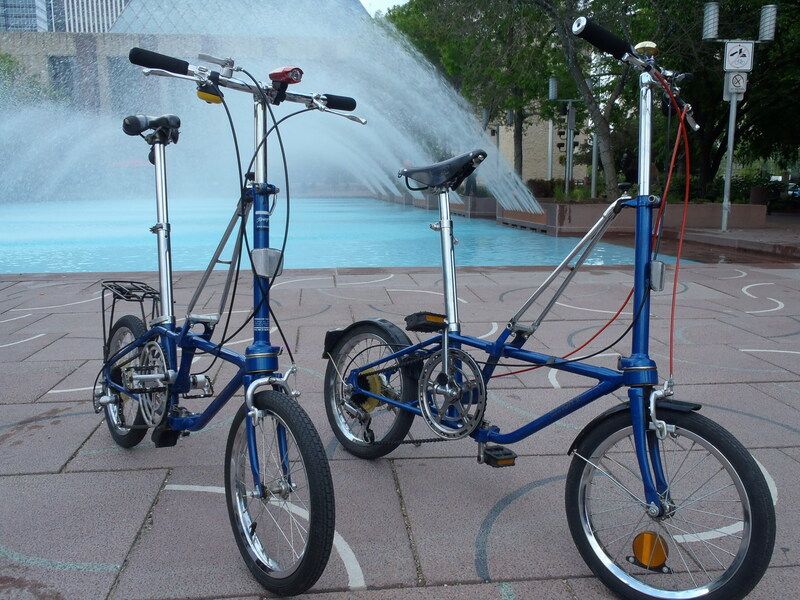 There were two 80s era Dahon V bikes, as well. 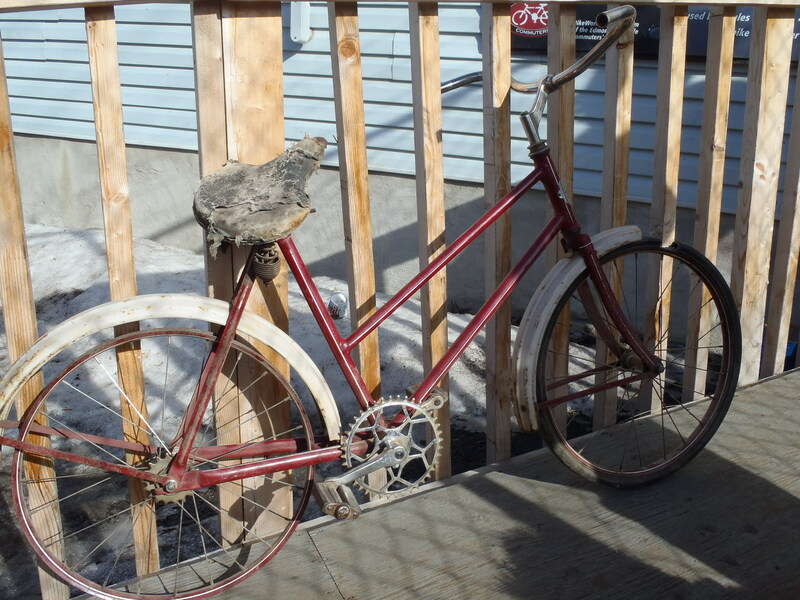 I have one of these in the garage at home, but I rarely ride it. Although they do fold up into a considerably small and tidy package, I was never fond of the ride quality and the general creakiness of the folding connections. The steering is twitchy enough that I was sometimes nervous to take one hand off the bars to signal a turn. By contrast, the R20 is very solid and feels much like a regular sized bike. The RBF demonstrates the fold. 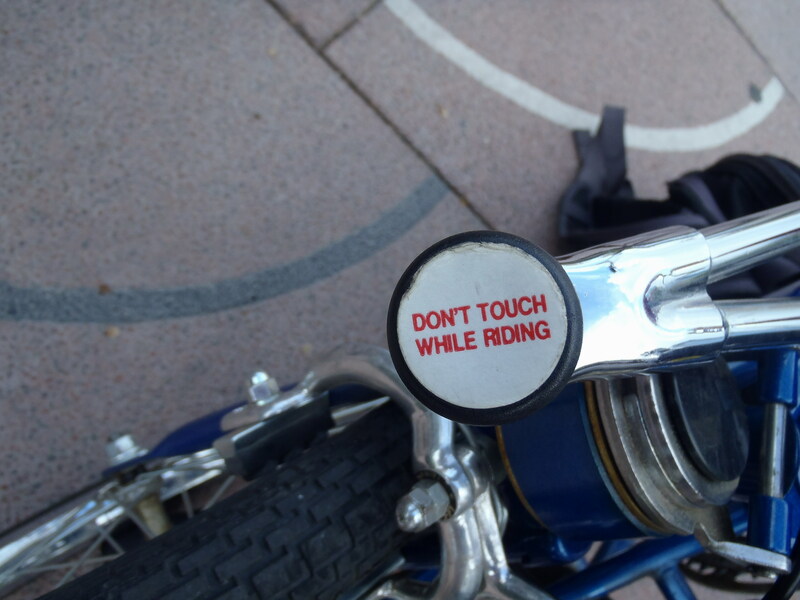 This is good advice, as if you do press this button the bike steering will be free to fold. 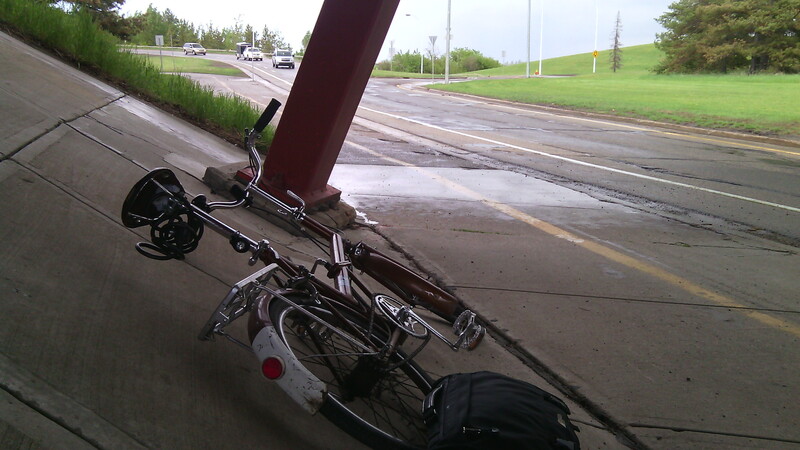 In fact on two occasion, this happened to me while riding my Dahon V, without me even touching the button. 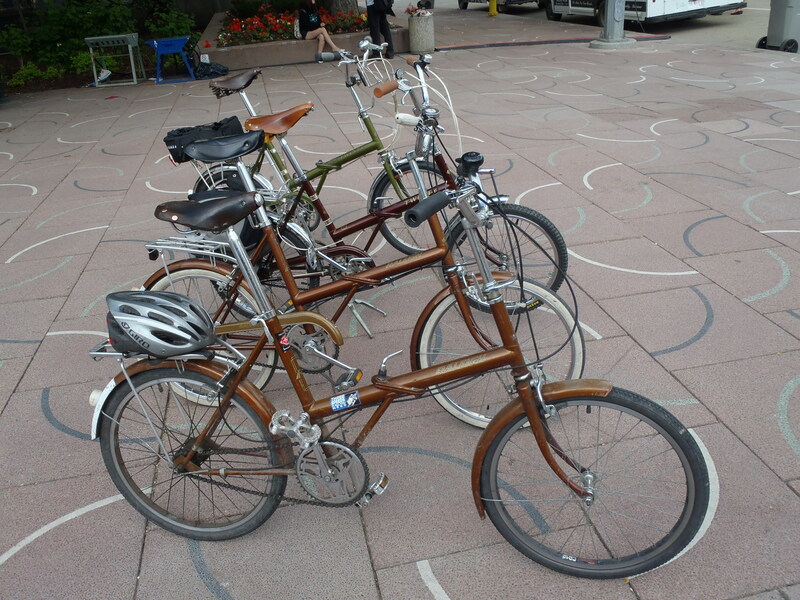 Another reason I’m leery of these bikes. There were three other old folders, each with interesting features. 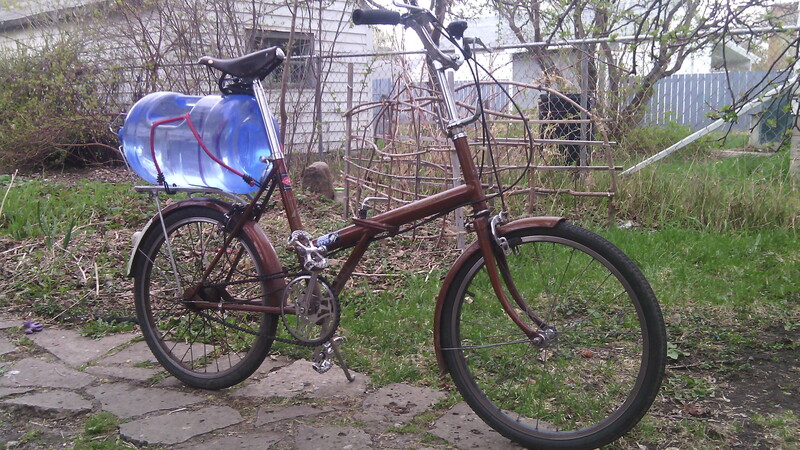 Evillerider’s Portabike, converted to fixed gear and a veteran of more than one winters riding. 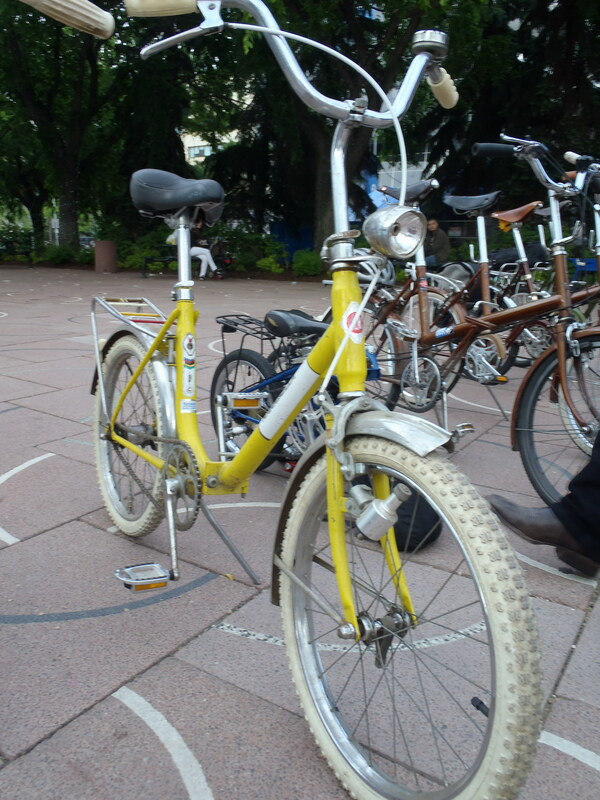 Also from Evillerider’s fleet, this one with a two-speed kickback hub. This one has the best name. I forget where it was made. Eastern Europe? My camera stopped working just after we started riding, so I don’t have any pics from then on. 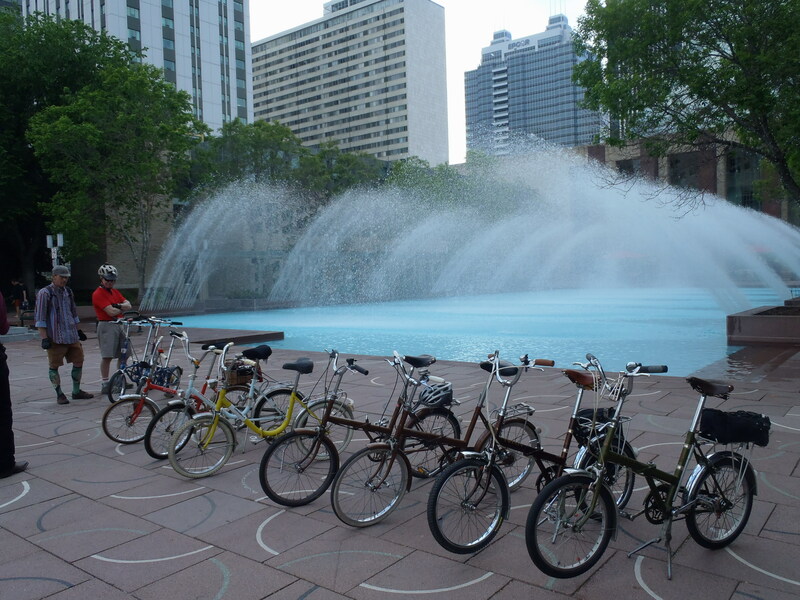 We cruised around the edge of the river valley, stopped at a pub for a beer (where the manager asked the RBF to remove his folded Dahon from the table), stopped at my favourite local playground in Borden Park where we enjoyed a spectacular sunset, and finally did a bit of parkade exploration downtown. I’d say my R20 has no reason to complain of lack of attention this summer. 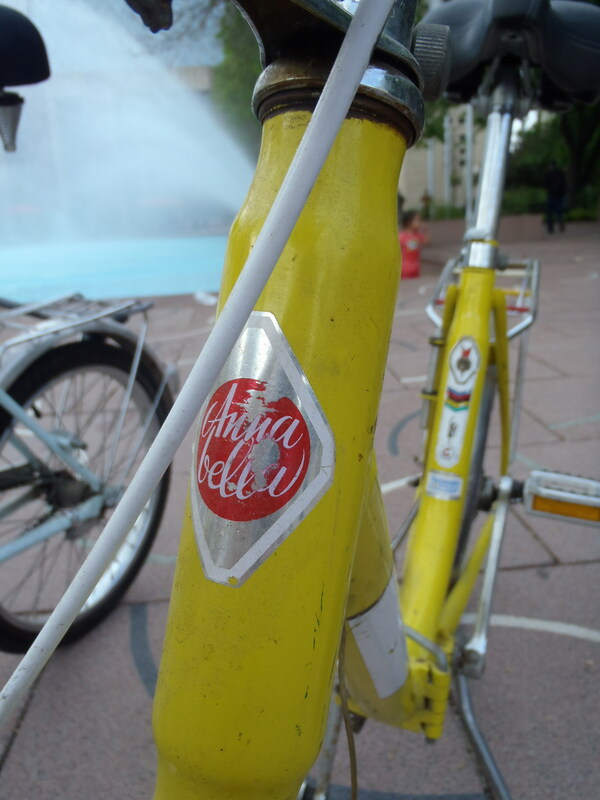 We commuted and rode recreationally, through fair weather and foul, by night and day. 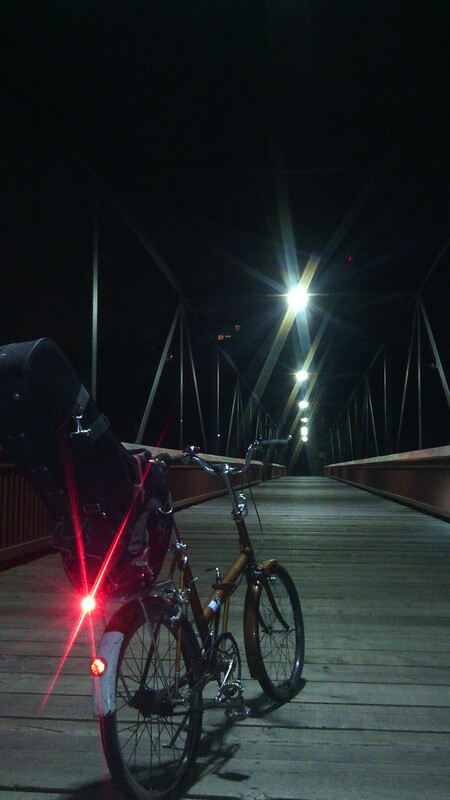 I will include one parting photo, taken on the soon-to-be-replaced downtown pedestrian bridge on the way home from a friend’s birthday party. In the instrument case is my resonator mandolin. 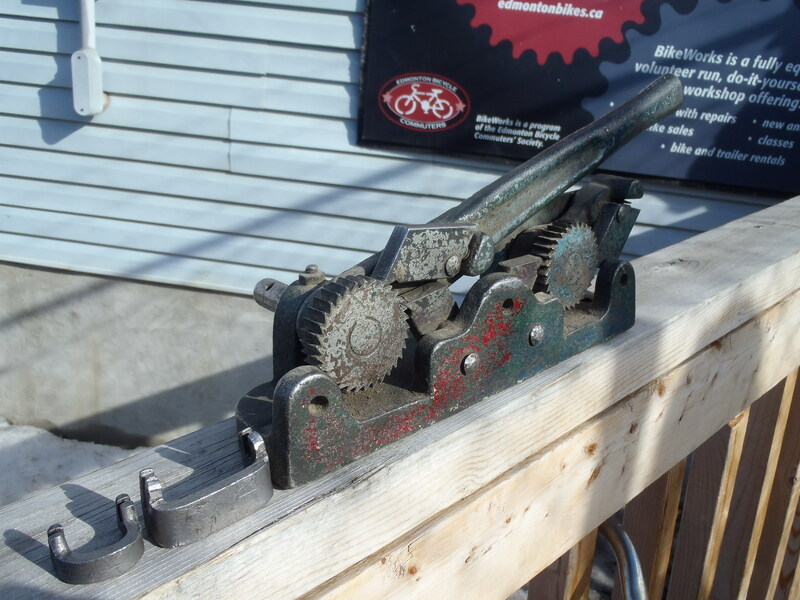 Mystery antique bike tool – can you guess its purpose? Hanging out at our local community run bike shop, Bikeworks North, has given me many opportunities to glimpse the diversity of bicycle technology new and old. While it’s neat to occasionally see somebody wander in with a skookum carbon fiber bike (that cost more than I could sell my internal organs for on the black market), what I enjoy most is getting to see some of the odd avenues that bicycle manufacturers have wandered down in the past. I freely admit that it doesn’t take much to impress me. As a 40-something year old whippersnapper who has really only been sucked into the cycling history vortex in the past couple of years, I have a lot to learn. The internet is, of course, a wealth of easily accessible information but you can’t beat the opportunity to actually to see something in person. Earlier this month I was lucky enough to be in the shop when an older gentleman brought in the tool shown in the opening photo. This fellow is 85 years old and operated a bike shop decades ago. I didn’t catch when he shut down his business, but judging by the NOS parts he donated during an earlier visit, it was likely in the early 80’s. He commented that as a small shop he couldn’t compete with the volume discounts that the suppliers started offering to the big stores. 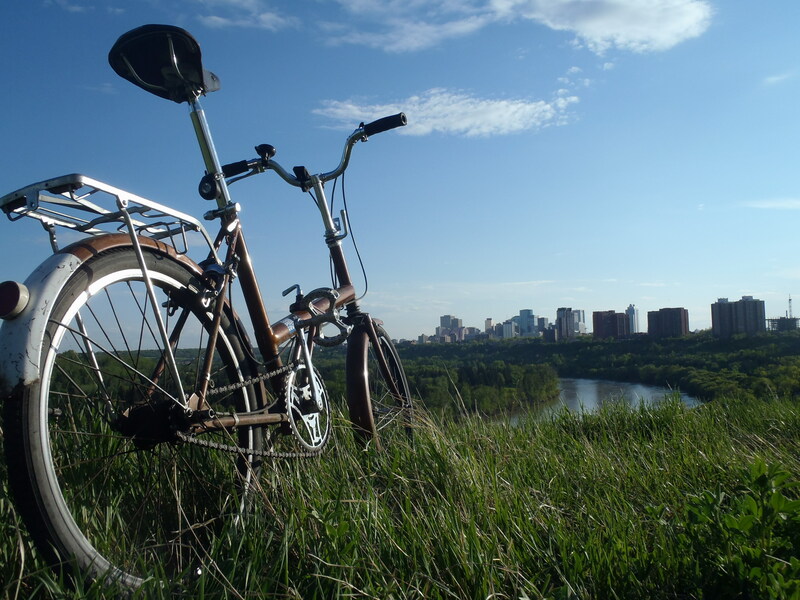 It interesting to chat with him about the cycling shops that have come and gone in Edmonton long before I moved here. On this day, he had brought in an old bike tool and he challenged the volunteers present to guess what it was used for. I was well out of my depth here. 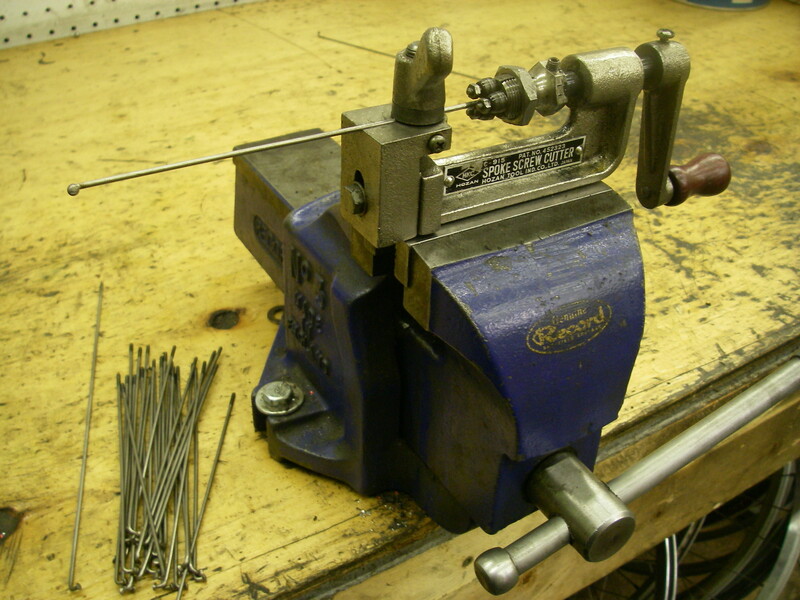 It was looked to be double-ratcheting, tightening something with both the up and downstrokes of the lever, which reminded me of a cider press I rented once. However, I couldn’t guess what would require that on a bicycle. Here is the other side of the tool. 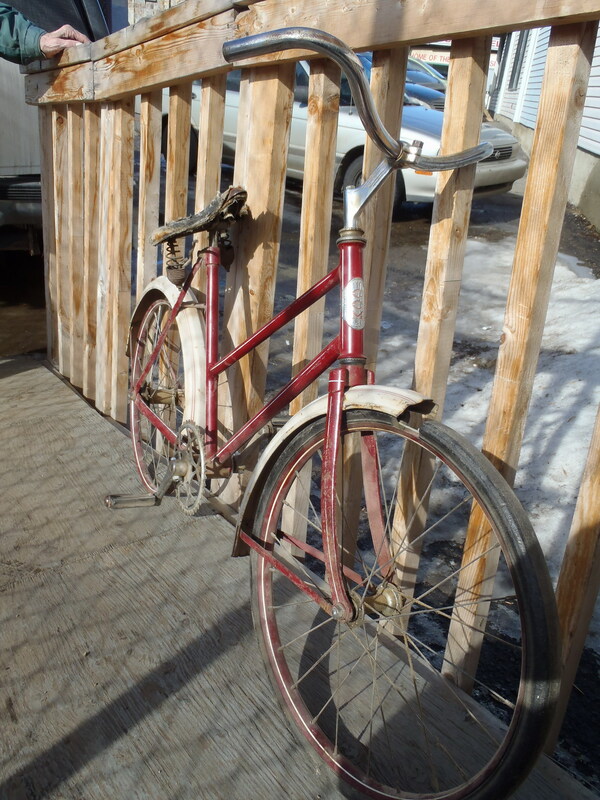 He also brought in a child’s CCM bike dating from the late 40’s or early 50’s. This was nifty to look at all on its own. In the photos below, an observant reader might be able to spot a clue to the intended use of the tool. This use of the mystery tool dates back to the dawn of cycling and something of its sort was used with the iconic penny-farthings. I imagine it wasn’t much used by the 1940s but was still a requirement for working on children’s bicycles as well as for baby carriages. Still stumped? The next photos should clear things up. Pneumatic tires have been around since the late 1800’s but before that solid rubber tires were used and were tightened onto the rim by means of an internal wire. The mystery tool was used to tighten the wire. 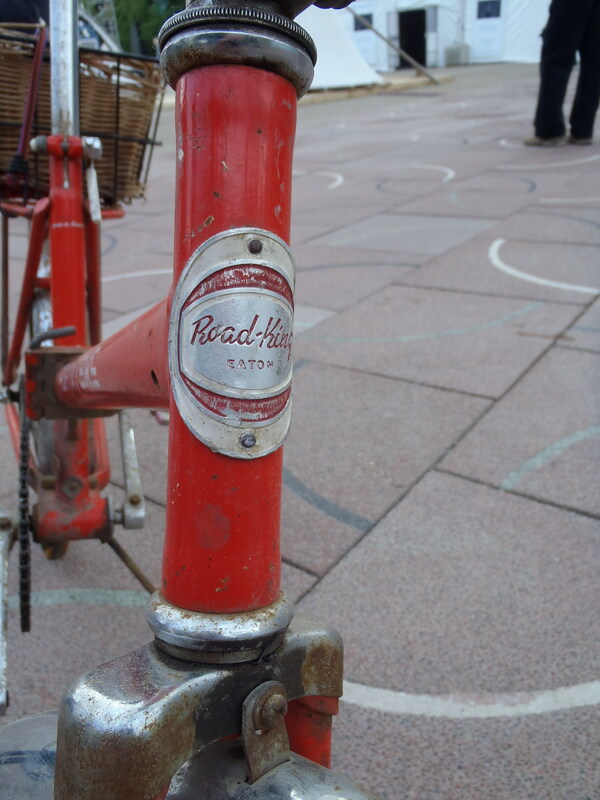 While the cushioning effect of the air-filled tires made them immediately popular, the durable and puncture proof solid tires remained in use for some applications. 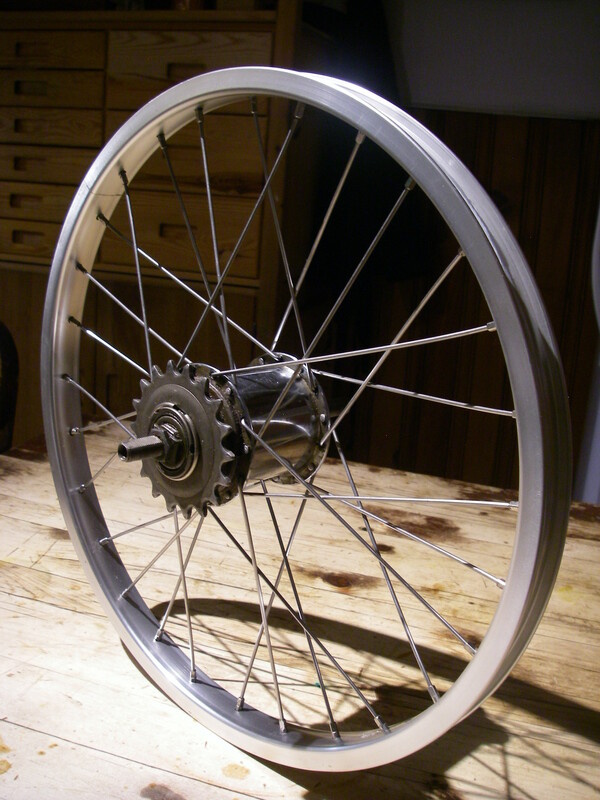 Even today you can still buy modern varieties of airless tires. 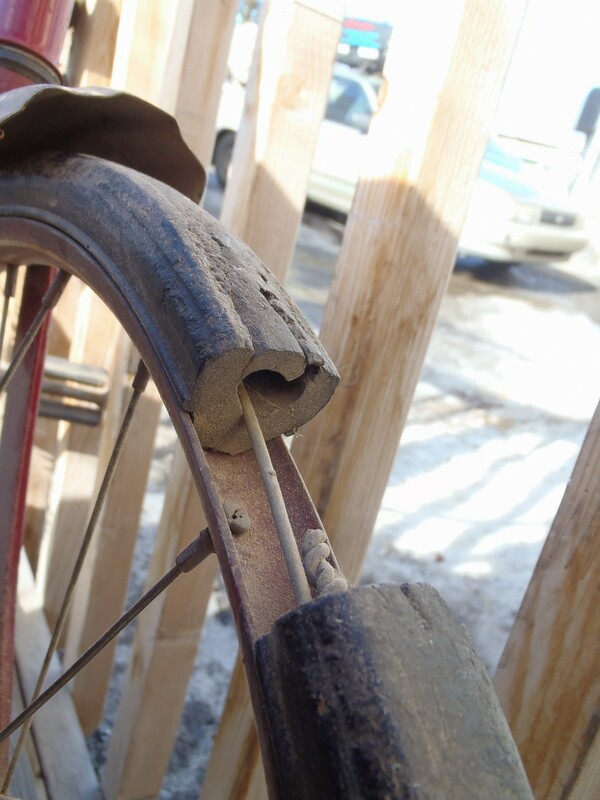 The photo above shows a tire that wasn’t properly fit to the wheel. 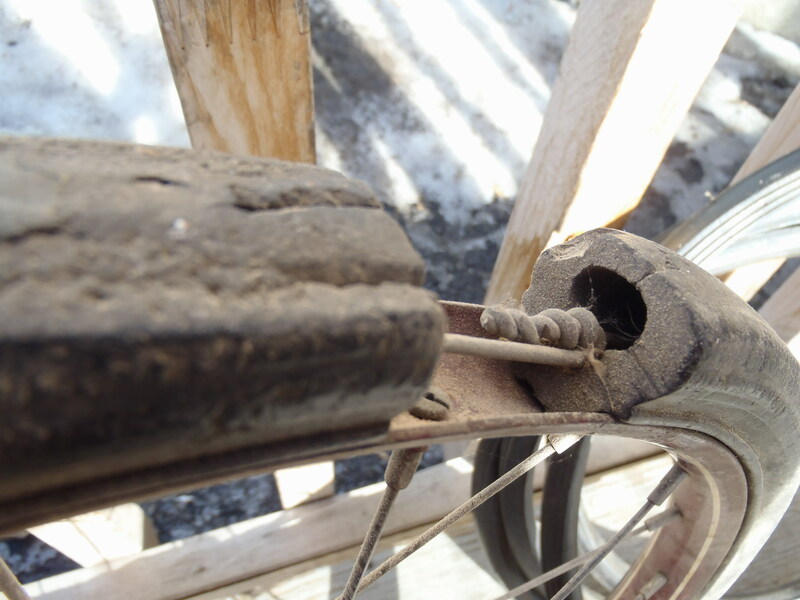 The tire material was sold in coils and you would simply cut off the length you needed for a particular wheel. 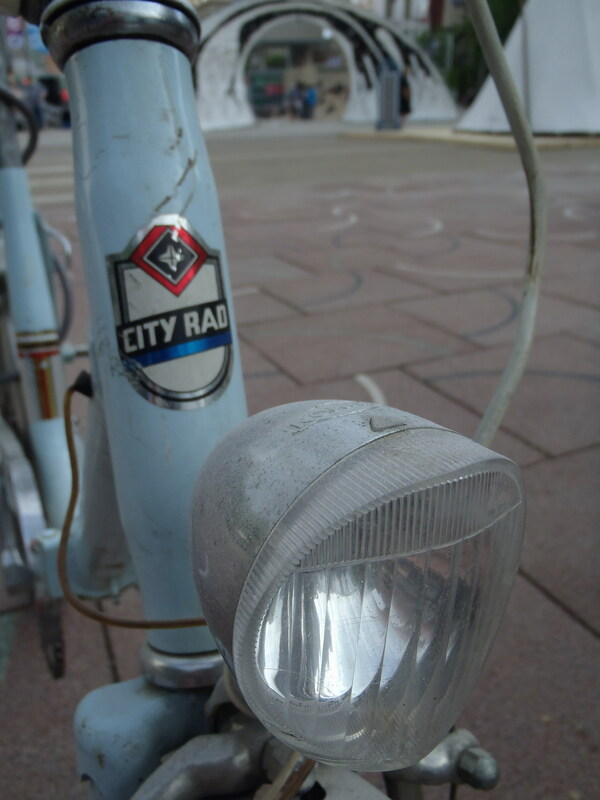 My wife doesn’t share my bike interests, but is tolerant when I pester her to look at something I find interesting. When I showed her the photos of the tire machine, I was surprised when she said she had seen one before. 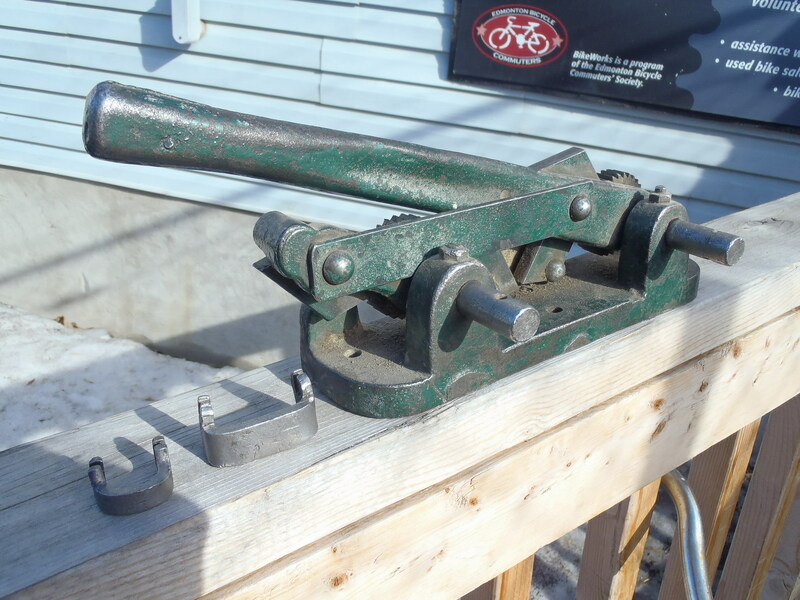 Her grandfather was a cobbler in Saskatchewan who also repaired bike wheels and she remembered seeing a tool like this in his shop. 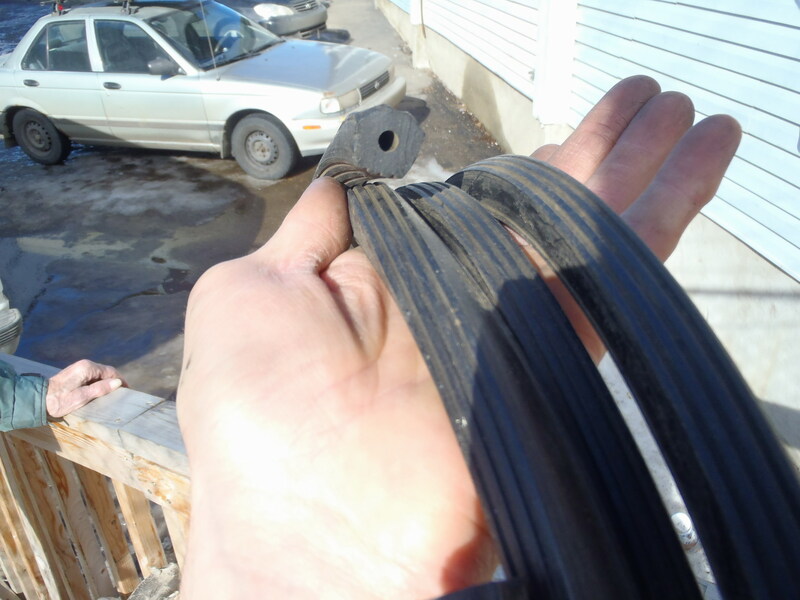 She had also seen the coils of tire material there. When I mentioned that these sorts of tires had been used on baby carriages she said that there were carriages handing from the rafters of his shop. I snooped around the internet for a bit, and while I didn’t find an example of this particular type of machine being used, I did find some examples of different machines being used for the same job. Here is a video of one in use. I doubt I’ll ever have occasion to use a device like this but it was fascinating to learn about this old style of tire. 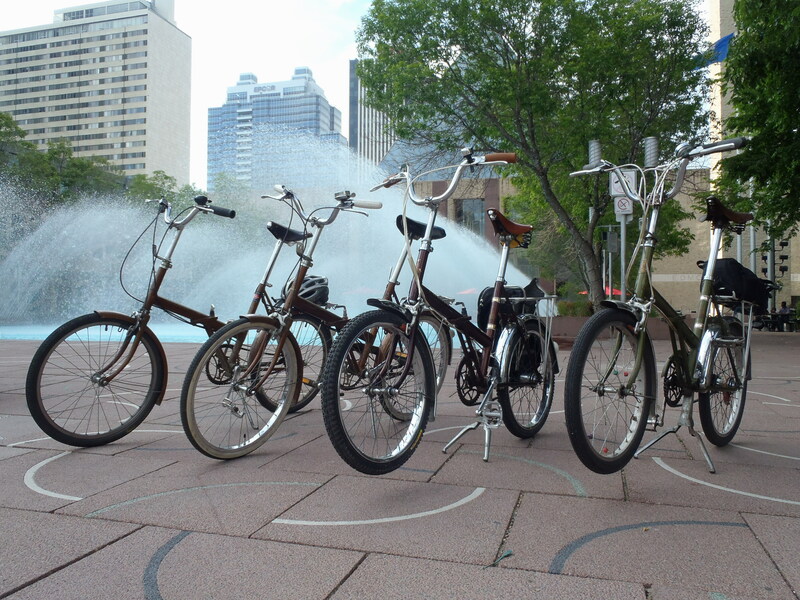 Maybe I need to add a penny-farthing to my small fleet.